GM's LS7.R has just been named the Global Motorsport Engine of the Year. The 2006 Race Engine of the Year Awards were organized by Race Engine Technology magazine, which invited votes from 50 key race engine engineers. GM’s phraseology explains that the race-prepared LS7.R engine “shares its architecture with the production LS7 small-block V-8”. 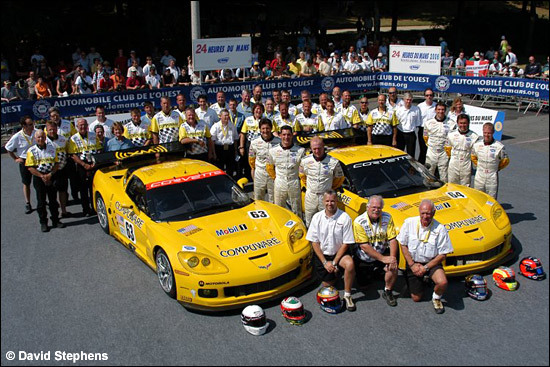 The LS7.R powered a Corvette C6.R to a second win at Le Mans this year (the first 24 hour win for this particular engine), and the team’s two Corvettes wrapped up all the titles in the American Le Mans Series in 2006, with perfect reliability from the engine and cars. "The championship-winning LS7.R has evolved to a very high level of development,” says GM racing directoir Mark Kent, “yet it retains the longstanding virtues of compact size, simplicity, reliability and high specific output that have made the GM small-block V-8 the world's most successful production-based racing engine." The C5-R and C6.R Corvettes have certainly been durable, as have the LS6 and LS7 engines, throughout the racing lifetimes of these remarkable cars.